I Still Have a Dream | Teens Dream Co Lab is a collaborative of teens and adults who encourage teens globally to be change agents in their communities, and the world! Teens Dream, and ultimately the creation of the Co Lab, were inspired by Martin Luther King. The Global Co Lab Network was created after a series of living room gathering where teens and adults brainstormed how they could build on King’s dream, which they did with Teens Dream. 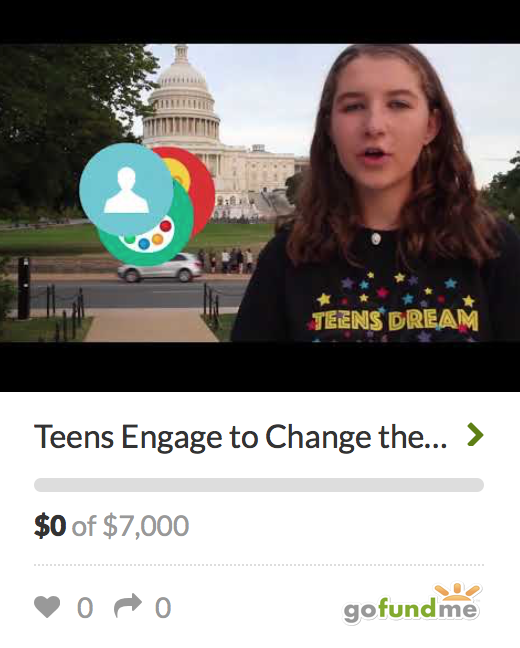 A digital platform for teens to express, share and connect around their dreams via an annual video competition, Teens Dream has in just two years received over 130 videos from teens globally highlighting dreams, for themselves, their communities, and the world. See a recent television show on Teens Dream hosted by Arlington Independent Media! Of great excitement, this year’s video competition will link teen’s dreams to one of the UN Sustainable Development Goals! This October we celebrate the winners from our 2015 Teens Dream competition at the Smithsonian. Teens Dream winners and submitters, including our grand prize winner JAYO from London who wants to inspire people with his music, will come together to meet and connect with Teens Dream co-creators, supporters, and mentors. We have launched a crowdfunding campaign with YouCaring to bring the winners to our celebration and scale Teens Dream to reach more teens globally. Please check out our campaign to raise $10,000 by October 8th! While we are planning for our big celebration with Teens Dream, the Co Lab continues to host salons. This summer we co hosted three, one on climate change, a second on inter-generational engagement among millennials with follow up salons and another television show in the making. We also have been meeting with partner outreach organizations including presenting our work at the United Nations and hosting a salon on global exchanges with Global Ties US! We are excited about the coming year and the opportunity to continue to build intentional networks among existing organizations in small living room gatherings, working to empower a greater numbers of teens and millennials around issues that matter. Join our team and let’s act on our dreams!